Welcome to the Marshall Marshall Athletics Lunch Time Sports page. Here, you will find out everything you need to know about the Lunch Time Sports programs at Marshall. To the right you will find links to the program. Lunch Time Sports is designed to encourage students to participate in a positive and structured sports activity during lunch at school. All students who sign-up will be required to follow the rules provided, and maintain appropriate behavior during designated playing time. 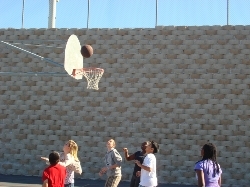 In addition, conduct at school may affect ability to participate (all school rules apply to Lunch Time sports). Teams will be scheduled to play during lunch on Tuesday and Thursday. Games will begin at 10:50 and end at 11:10. 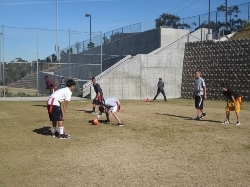 Players may play only on the teams they are signed up for. Students are expected to produce ID cards and wrist bands if requested by a staff member. Failure to do so may result in not being allowed to participate. Schedules and standings will be posted in the display case outside the Boys and Girls locker rooms and on this website. Teams are expected to know their scheduled play times. During play, no food will be allowed on the playing fields or courts. In addition, no late passes will be given to class following lunch. You are required to keep track of the score and report it at the completion of your game. A $20 dollar deposit is required at the beginning of each sport's season in order to play. The team will receive their $20 dollar deposit back at the end of a sport's season as long as they do not drop from the program. All teams are expected to play each scheduled game. 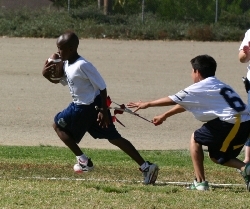 Teams are allowed one forfeit during the season. If a team forfeits two games, they will not receive their deposit back. We hope you have fun and benefit from the Marshall Athletics Lunch Time sports program.